The other day, I took Alistair out for a walk in his jogging stroller. Usually, the instant his five point harness snaps shut, his eyes close with equal ferocity and he’s out for the duration of the stroll. But this time, his baby blues were open wide in amazement. Birds, trees, cars and tall buildings – these are pretty spectacular sights for someone who has previously only been able to see as far as his feet. I was struck by the simple joy of experiencing the world anew through the eyes of my little one. Growth happens so quickly that “firsts” occur on an almost daily basis. He’ll never remember these moments (apart from the collection of photographs, memories and notes I weave together in his baby book) but I love being able to walk alongside Alistair and look at the world with a fresh perspective. For Alistair, his first Valentine’s Day was probably a day much like all others. 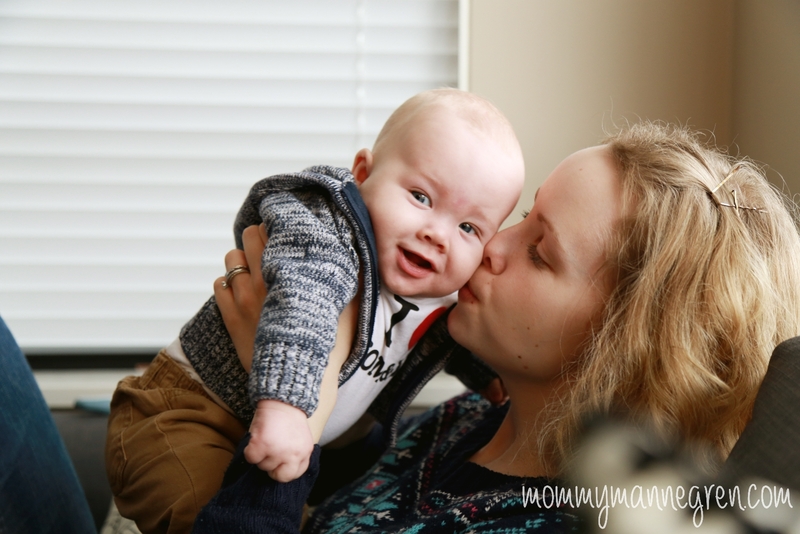 After all, how can mommy cram more hugs, kisses and snuggles into a 24 hour period than she already does? But nonetheless, I was excited to give him a taste (not literally) of what this sugar filled, love inspired holiday is all about. Normally, I’m not a big “card” person but when it comes to Valentines, it’s a different story. I look forward to the day when a little one hands me a folded scrap of scribbles and a fistful of freshly picked weeds. There will be nothing sweeter than receiving my first card with squiggly crayon letters that proudly proclaim, “I luv yu momy” and a crudely but carefully cut, construction paper heart. I know that at the rate he’s growing, I won’t have to wait too long for those crafts. 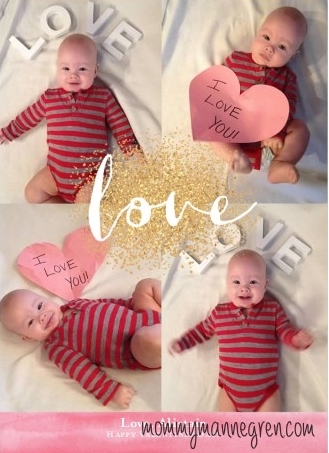 But for his year, Alistair’s cards were created on Shutterfly and sent to the loves of his little life – Daddy and the Grandparents. I love Shutterfly. I use it for just about everything print related: our Wedding Guestbook, Ali’s Baby Announcements and his Baby Book. Shutterfly is like scrapbooking without the glue and expensive stickers. At least once a month, they offer some great deals (although by the time you ship it to Canada, it works out to be about the same) and always offer the option of using pre-designed or custom styles. Shutterfly will also ship cards directly to individual recipients, making it faster and easier for the purchaser. Who can resist a card this cute? I love how hanging a few decorations can totally transform a space, adding a little character and a lot of warmth. 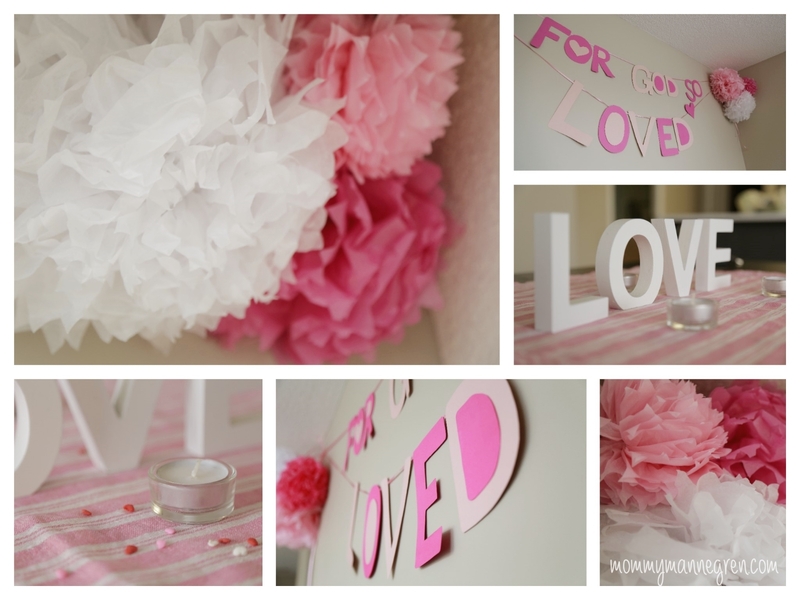 Obviously, this month’s decor was inspired by Valentine’s Day and my love of all things pink. I’m grateful for a husband who allowed me to take over the house with a bunch of pink pompoms and tea light candles. And speaking of pompoms – I seem to have fallen in love with these frilly, handcrafted decorations. The wall above our TV was looking a little sparse, so I spent a whopping total of $5 on Dollar Store tissue paper and ended up with 9 pompoms of varying size and colour. (The ready-made ones from a certain crafting store were ringing in at anywhere from $3 – $5 per pompom!!! Yikes!) I love how simple and yet functional these decorations are; in fact, they’re probably my go-to choice for all future parties. 1. Start with ten sheets of stacked tissue paper. 2. Fold tissue back and forth like an accordion. (I made my folds approx 5mm in size). 3. Tie ribbon around the middle of the folded tissue. 4. Trim the ends into triangles (other shapes, or not trimming at all, will change the style of the pompom). 6. Once all layers have been separated, fluff as necessary and enjoy! Don’t worry if you accidentally rip a piece of tissue. My pompoms had more holes than Swiss cheese but by the time they were fluffed and hung on the wall, it wasn’t noticeable. To make pompoms of different sizes, trim the length of the sheet before folding.To create a denser pompom, trim the tissue so that it is tall and skinny, rather than short and wide. The pompoms that I feel turned out the best were trimmed in size to three quarters of the tissue paper. Whats Valentines Day without a mouthful of sugar? Sugar cookies, that is. I found this recipe at Sally’s Baking Addiction and after reading some rave reviews, I knew I had to try them. I’m rather embarrassed to admit it but I can’t even remember the last time I attempted to make cookies. This apartment has definitely never been christened by freshly baked mouthfuls of goodness and we’ve been here for over a year and a half! I still haven’t figured out how to juggle a screaming baby and a rolling pin at the same time, so after the Ali-gator went to bed, the cookie elves made some magic. 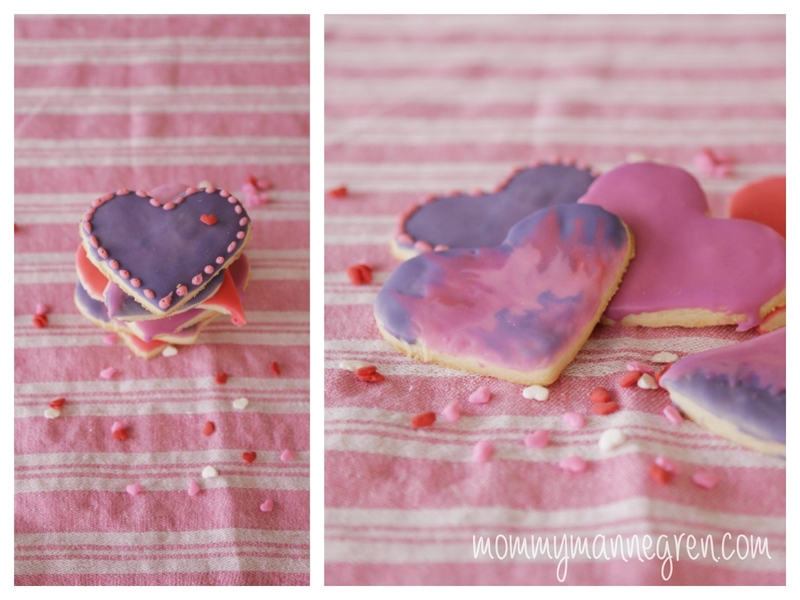 They were easy to make and I loved the detailed instructions and photos. 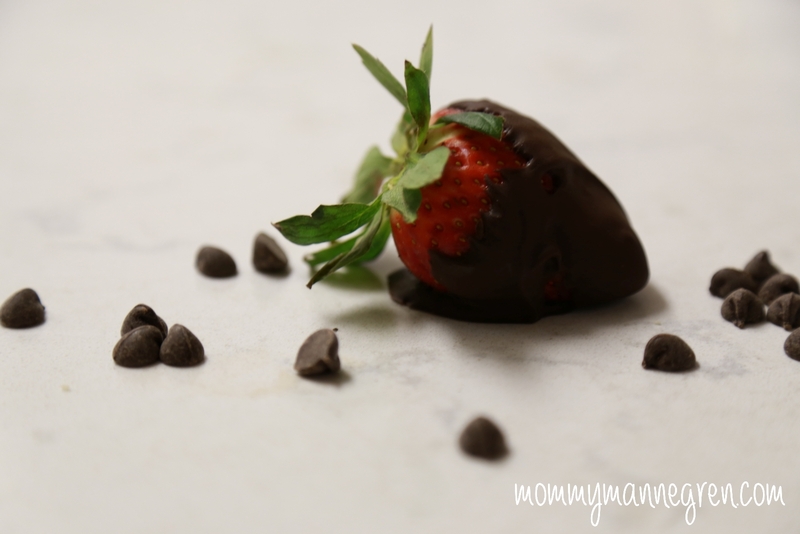 Making chocolate covered strawberries is pretty much the easiest dessert ever. Why haven’t I made these earlier? 4. Place pan in fridge and allow to cool for at least 20 minutes. Once chocolate has hardened, remove strawberries from pan and enjoy! For special occasions, I love setting aside a specific outfit for Alistair to debut.There’s no quicker way to melt a heart than to put your grinning baby into an “I love Mom & Dad” onesie. This was probably the first gift that we received for the boys (Thank You Auntie Daleena) and although it was still a teeny bit on the large side, what better time to bust it out of the dresser than on Valentine’s Day? Part two of Alistair’s Valentine’s outfit: his socks. When I was younger, my mom used to give each of us kids a fun pair of socks for Valentine’s Day. I was excited to see that Grannie was continuing this tradition with Alistair. 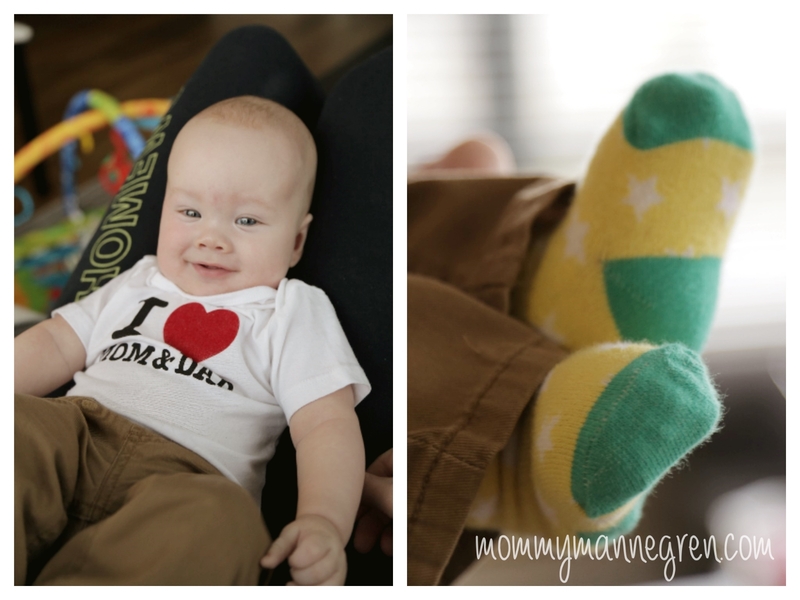 Seriously, baby toes clad in colourful socks may just max out your daily dose of cuteness. How did you celebrate Valentine’s?